Don't let your location limit your power supply! This universal, Global Travel USB Charger was made with jetsetters like you in mind. Included, interchangeable plugs will keep your energy high, no matter how far you've traveled. Where in the world is Carmen Sandiago? Doesn't matter - she'll be powered up. Includes interchangeable global plugs, perfect for international travel. You've got the power! It's all in the ports: (1) USB-C + (3) USB-A ports to charge multiple devices all at one time. (Up to 4.8A total). Bag it up: Included drawstring bag helps you keep it together, even on-the-go. Gadgets galore: Perfect for charging your phone, tablet, watch and yes, even your travel fan. Score! 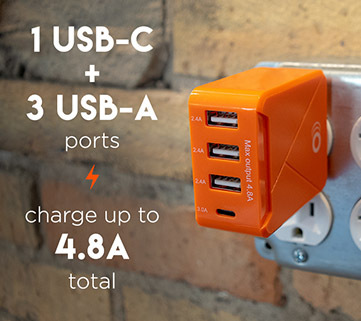 Power up to 4 devices anywhere in the world with the interchangeable power adapters. Move over Pitbull, there's a new Mr. (or Mrs.) Worldwide in the building! Traveling all over the world should be an enlightening life experience that needs to be captured because you certainly won't remember after that 3rd sake bomb. Keeping your phone and other gadgets powered up on the journey is a necessity. Feed your concerning social media addiction from anywhere in the world! These plugs work in a ton of countries, below are just a few examples. If you want to be sure, just Google the country you are visiting, the internet is a wonderful place...sometimes. To use a different plug, fold up the standard type A plug, and slide one of the adapters it. It'll snap in, and you'll be ready to go. Note that the adapters have a tight fit, which is necessary for a quality electrical connection. It'll take a decent amount of force to remove, but don't worry, it's supposed to be like that. You can even count it as your workout for the month. 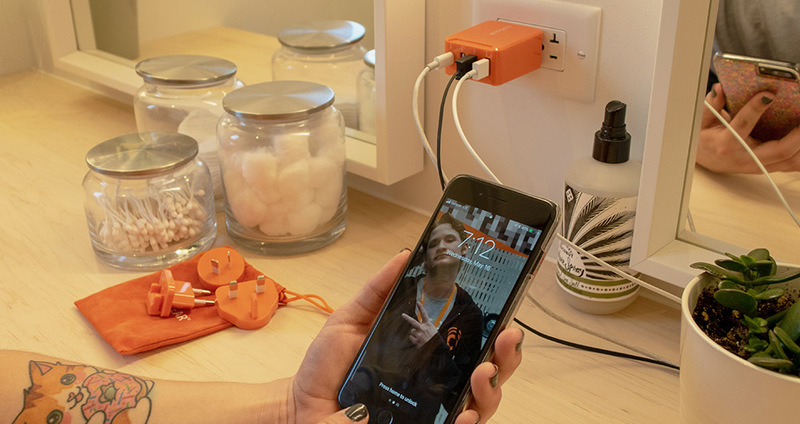 Charge up to 4 USB devices at once with this charger. It has one high-speed USB-C port, and 3 standard USB-A ports. You and your travel companion will be juiced up more than Barry Bonds, and ready to call for help when you get lost in the Icelandic tundra. You can call us if you want. 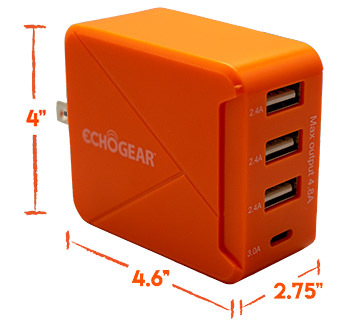 In addition to the suave interchangeable adapters and a plethora of ports (we can be classy when we want), the Echogear global travel charger is orange. The eye-catching color is an attempt to overcome your tendency to leave chargers behind in hotels and airports. We've got your back. If you needed even more orange in your life, you're in luck. 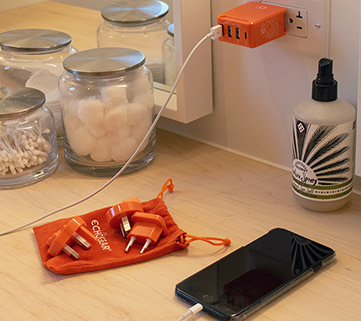 It comes with a handy orange pouch to keep all your adapters together. Right after a passport, this charger should be the next thing on your pack list. Pick one up today. Click the button below to add the Universal Travel Power Adapter With 3 USB-A & 1 USB-C Ports to your wish list.